Fast forward five years later and the memories I have with Minecraft are too numerous to completely share. Highlights though would be my kids sharing their knowledge with teachers via skype and going to different conferences sharing my story about the possibilities of Minecraft in the classroom and meeting so many different people along the way. As well, the amazing projects my students did – rebuilding famous structures, recreating settings from our read aloud novels, making Array cities, designing and creating new schools for our district and so much more. The stories I have of my kids – the boy frustrated in other classes because he struggled with things like writing becoming the class expert, the one who others went to when they had problems in Minecraft, of another boy who had never been challenged in school, everything came easy to him until he was challenged to build something in Minecraft and everything that could go wrong did and he had to learn not to just quit and give up. I have shared the story of the girl who found her “voice” when it came to Minecraft and sharing her design. I have so many stories that will be tucked away as great memories. The other thing that has started to happen is other staff in my school are coming around to the potential of using Minecraft. 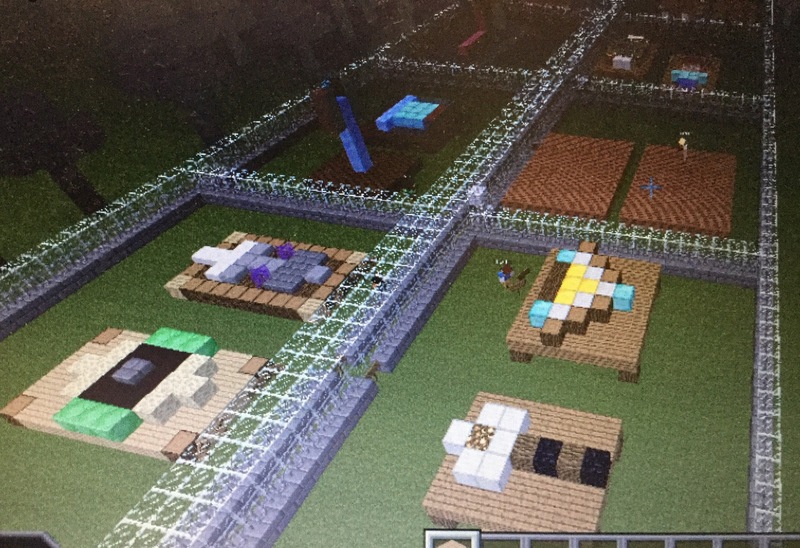 The grade one classes did a project where they compared urban and rural communities in Minecraft, the grade two classes had their students share their understanding of patterns in math in Minecraft. My grade partners even got in on the action and did quite a few projects with me. It’s been great to see how it is slowly being used across our school. So last week when it came to pass that Windows 10 would be coming to our site which meant our friend Minecraftedu would most likely no longer be able to be used, both the kids and I were sad. We had so much fun this year with it, we had built so many wonderful and fantastic things with it, how could we say good-bye? However, as this door closes on this adventure, a new one is opening. I have the opportunity to test out Minecraft education edition at my school site with my littles. We will be one of a few schools to try it out. I won’t lie, I am nervous and scared. I don’t know Ed edition like I do edu. There are many things new to get used to, I honestly feel quite intimidated. The thing is I know, just like five years ago, when I started with Minecraftedu, there were many things I had to learn, things I figured out as I worked hand in hand with my kids, quite often we figured it out together. So now this will be our new adventure. We will open the new world and see what it brings. The thing that is also different this time around is I have a much bigger group of experts to draw on, my Minecraftedu people are a treasure trove, I know any questions I have, they will help point me in the right direction. Plus I have my littles, who aren’t afraid to just jump in and figure it out as we go along. That’s the great thing about kids, when it comes to Minecraft they aren’t afraid to make mistakes, aren’t afraid to say ok, back to the drawing board. I’m just crossing my fingers that I don’t have another “saving the world” moment this time around. This entry was posted in Uncategorized on April 23, 2017 by catherined2014. This year’s Cardboard Arcade started off much like the last two, with a whole lot of cardboard, excitement and chaos. 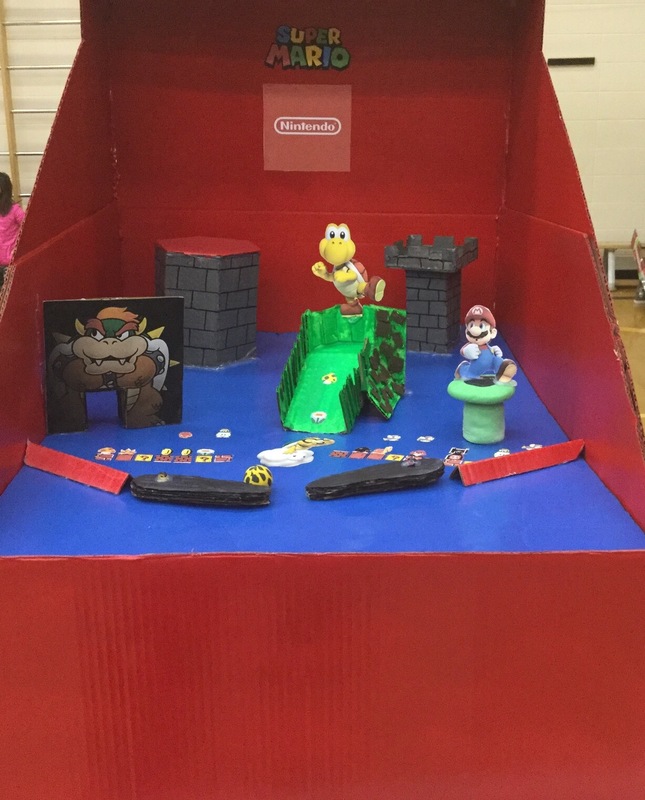 This would be our third year doing the Cardboard arcade (a post about our arcade last year can be found here ) and one would think it would be a well oiled machine by this point, however, it wouldn’t be me if I didn’t convince my grade partners to change it up and up the ante. But I’m getting ahead of myself. We started things off with a video as a provocation courtesy of the Caine’s Arcade. We brought all 64 grade three students together, watched the video and then brainstormed cardboard game ideas. It is funny that I have watched this video so many times, but when you watch it with students who are watching it for the first time, through their eyes, it is so exciting and heart warming. The kids hit the ground running and were excited to put together their games. For the next few weeks, it was a mess of cardboard, duct tape, glue and paint. There were tears when things didn’t work as planned, kids having to go back to the drawing board because the games weren’t hitting the expectations of “is your game sturdy, functional, and eye-catching?” For some they had to learn the hard lesson of adding more and more duct tape might not be the solution. When it came to game building, I always stepped back because I thought it was important for them to try to problem solve. While I might guide, I never just gave them the solution. Funny enough, sometimes their solutions, I might not have agreed with, actually worked out just fine. 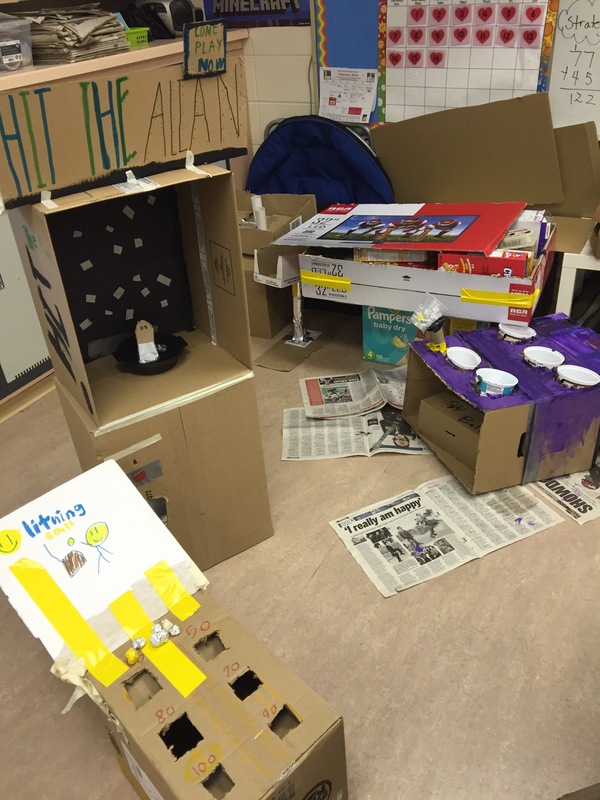 The extra piece I decided to add on this year was that I would have my twenty grade 5-6 coding club kids build their own cardboard arcade games and join us. This would mean the total game count in the gym would be 84 games which would involve some serious organization to not only fit them all, but also have it set up so their games could actually be played. 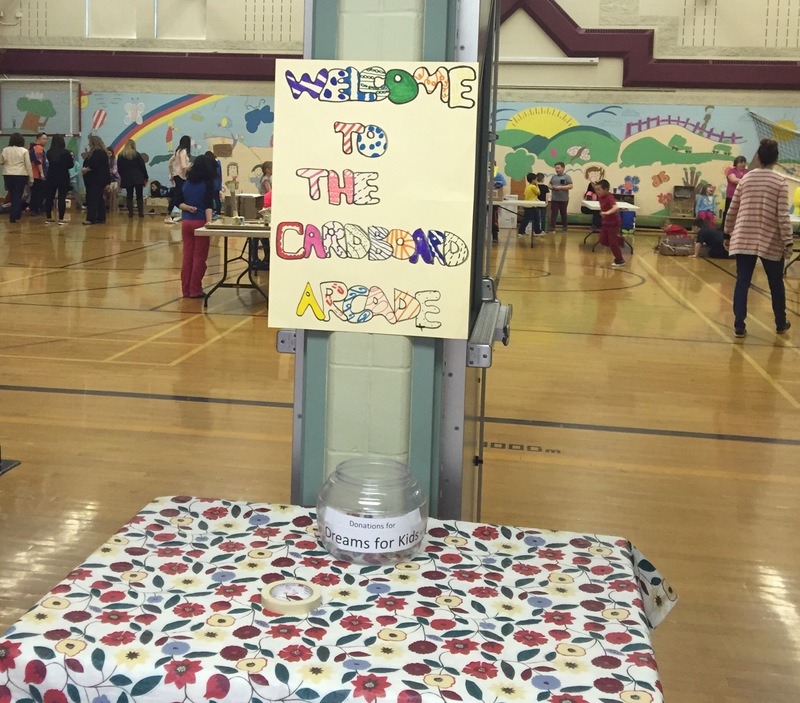 The other added challenge was we decided to open up the arcade to the whole school this year. In the past we had only allowed the primary grades to participate. However, I had many upper elementary students talk to me about how they wanted the opportunity to come in and play, so after some discussion with my grade partners, we decided to give it a shot. We would somehow get all 412 students through the arcade in one day. The day of the Cardboard arcade would end up being the 2nd last day before our March break. We brought all 84 kids to the gym and got things set up, hoping we’d get through this day. Amazing enough, it went awesome. Before any group came in, I would gather them in the entry to explain how these were cardboard games so please be kind and careful. As well, with the upper grades, I reminded them the importance of being kind with their words. While a game might not look that great, saying it out loud where a grade 3 student might hear them, would be disheartening so to be aware of that. The thing was we didn’t need to worry about this. Honestly, when the grade five and six classes came in, they were just so excited to come in and play, they became like little kids. 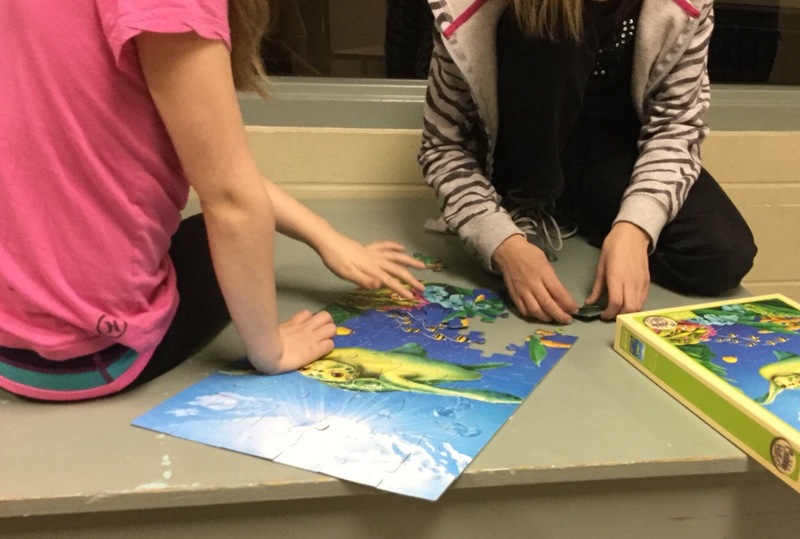 They played games, laughed, challenged each other but the greatest thing they did was tell the grade 3 students how fun their game was, what an awesome idea they had for their games. The looks on many of those grade 3 students’ faces is not one I will forget too soon. So often we will not take chances and try things out because we are trying to ensure the kids are okay, that no potential problems will occur, that no one’s feelings get hurt and such. The thing was that we were looking for problems that didn’t happen, everyone that came was just so excited to be there that they had a blast. The gym was full of fun and laughter all day. The one thing that we did learn was that it was a very long day for our kids, by the end of the day after being in the gym for the whole day, they were exhausted. This will be something that we need to revisit next year when we start planning again. For me, this year’s arcade memory comes courtesy of one of my grade six coding club boys. His story is like many, he doesn’t shine when it comes to school. Reading and writing are not his strengths, he is not the most popular, not very artistic or the most athletic. He is quiet and shy, quite content to hide in the background. When we started the cardboard arcade, he asked if he could work on his game at home because he had this idea he wanted to try out. I agreed because I knew I could trust that he would do this on his own. The day of the arcade came and he and his mom brought his game to the gym and I won’t lie, he blew me away. He had built a cardboard pinball machine game. His mom explained he had spent many, many hours working on it. He had researched, built many versions that didn’t work, had spent hours on Youtube learning how to put the pieces of his pinball game together. But the end result was honestly fantastic, I know I could never had done it. That day, at cardboard arcade, he had so many students flock to his game. So many of his classmates were impressed, asking him questions, telling him how cool his game was. It was his opportunity to shine, and while he didn’t exactly revel in it, I knew by the smile on his face all day, that he was happy. And for a kid that has had the road he has had, this for me was worth it. All the challenges in organizing, trying to fit the coding club kids in, didn’t matter because he had this positive memory which made it totally worth it. 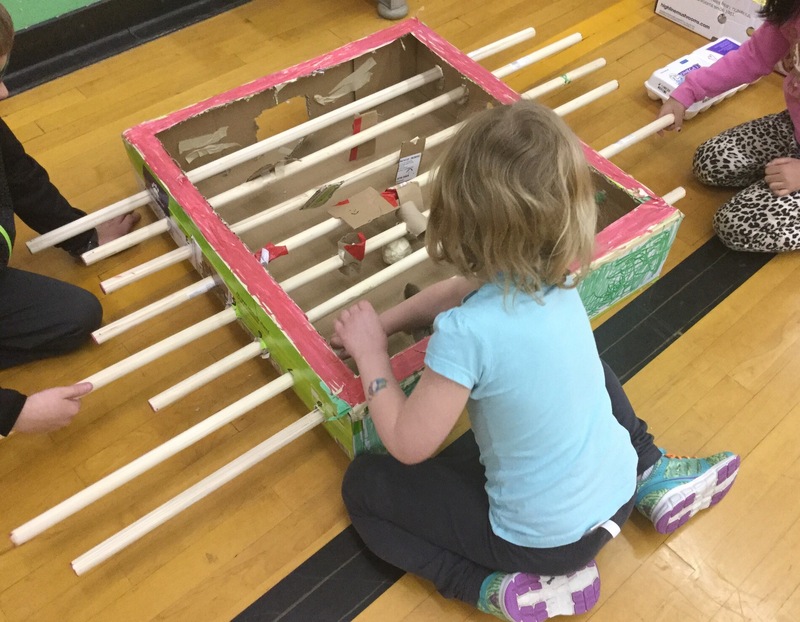 Another cardboard arcade went down in the books and as I walked down the hall I could hear the younger grades going, “Well when I do cardboard arcade in grade 3, this is how I am going to do my game” and I won’t lie, it made me smile. This entry was posted in Uncategorized on March 30, 2017 by catherined2014. We Got to Play and It was Good…. Many people do not know this about me, but I’m a country girl. The first twenty years of my life I grew up in what I called the boonies. It was house filled with horses, dogs, cats, people and even a lone sheep 🙂 I spent my life playing in coolies, forests, tree forts and swamps. Quite often, my sisters and I would come home with pockets full of all sorts of interesting things that my mother made us leave on the steps before we walked in the door. I worried about my peanut growing up in the city that she would not get these same experiences as I did growing up. Funny enough I did not give her or my husband and I enough credit. We spend most of our days at parks and playgrounds, her favorite thing to do when the snow is gone is ride her bike and scooter around our cul-de-sac. I’ll never forget the first time I caught her hanging from a tree branch, how proud she was that she had shimmied up a tree. What this has to do with today’s post on Global Play Day you might wonder. It starts with a conversation I had at Christmas I had with some of my students. I went around the room asking them to share one cool present they got but also to share one great thing they did over the holiday. Most of the answers were similar – they had gone tobogganing, they had gone swimming, but a new answer came up that sort of bothered me. I had two of my students share they got to spend the whole holiday “playing on the ipad.” I asked if they had done anything else fun, played with a friend, gone somewhere and they were quite happy to share that they got free, unlimited access to this technology. Don’t get me wrong, I am a big fan of technology – it has a place both in my workplace and at home. I am also that parent, when stressed and rushed trying to throw supper together, I will throw the iPad at my peanut just so I can have a few moments peace. But I also believe greatly in balance. I feel it is important for kids to have those moments where their face isn’t buried in a piece of tech. I believe they should have the chance to get out and play like we did when we were kids. Today was the day and I was lucky enough to be able to walk around and see Global Play Day in action. I walked around and saw imagination and creativity in so many different ways. Boys were making home made beyblade spinners with unifix cubes, there were card tower challenges, domino runs and so much more. Students right from kindergarten to grade six were just playing – they were laughing and talking. They were sharing, taking turns, collaborating, working together, building amazing things out of everyday things like blocks and cubes. They were creative, imaginative and just having fun. The power of that was something that should not be lost in this never-ending march of homework, standardized tests, and reading levels. They all loved knowing that they were part of a group of students across the globe playing like they were. I was lucky enough to even sneak a peek at my peanut and watch her building with her grade 6 buddy, making towers with magnets. Her and her buddy were talking away, she didn’t even notice I was there. It’s funny because I am sure if the students had had their way, this would have gone on much longer than it did. It was the teachers that were quite happy to shut things down. (it’s amazing how the volume can go up when kids are having fun). Our kids spend so much time in structure – in the hours at school and then the afterschool teams, clubs and lessons that many of them are involved in. I honestly believe it is important to give our students these moments where we can just to remind them how fun it is to be a kid. They will learn soon enough the responsibilities that come from getting older. To the organizers of Global Playday, you asked if we should add another day, to that I say a resounding yes. The more opportunities our students can have to moments like these, the more they can go home and say, “Guess what, at school I got to just play today!” And isn’t that a great thing? This entry was posted in Uncategorized on February 1, 2017 by catherined2014. Minecraft’s Just a Game, Isn’t It? I have been using Minecraft as a teaching tool in my classroom for over 3 years now, and a successful teaching tool I may add. It’s funny because every time I bring up using Minecraft in my classroom with other teachers who don’t know I use it, I get the same response, “Isn’t that just a game? Aren’t the kids just playing?” Time and again I have had to hold my tongue and explain how and why I use it. So for those of you that don’t know my spiel, here goes. In today’s classroom, the focus for our students is curriculum, I am not disagreeing with this. My students need to learn about how to add and subtract, how to write a proper sentence and how to read a paragraph in a “just right “book when they leave my room at the end of the year. Unfortunately, for some of my students, these skills can already be challenging. Even in these younger primary grades, students are already getting an idea of where they struggle or things they might not be as good as their friends are, they are coming in with a mindset that “Oh I am not good at that, so why bother.” Many of them may, at times, give up before they even start. However, when I introduce Minecraft and how they will be using it to showcase their understanding of different things we are learning in class, it is amazing how many of them perk up. They are surprised that they are going to be allowed to use Minecraft, something which many of them are coming in with an amazing set of skills already, and use it in the classroom. I always start the year explaining how, at school, Minecraft is another tool in their toolkit. They will be using it to show me how they understand what we have been discussing in class. 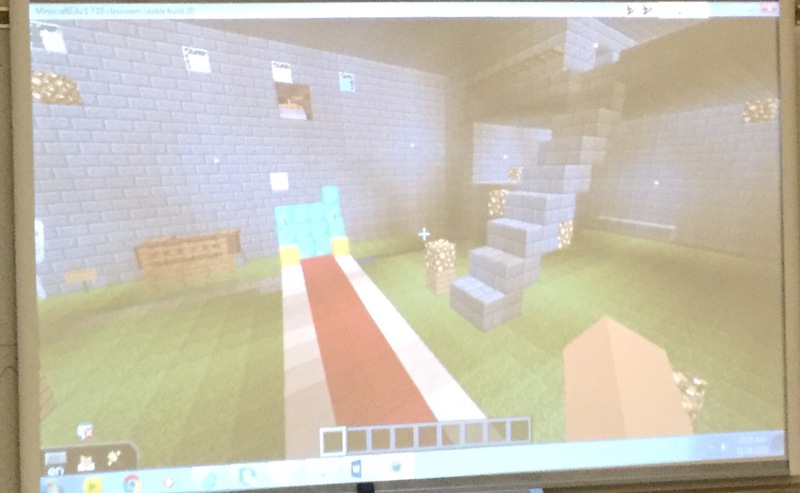 For example, when I allow them to use Minecraft to build a house for a character in the book they are reading and they must be able to tell or explain how this house suits their character, many of my students do not hesitate, they jump right in. The wonderful thing is the conversations we have that really do show how much they are getting out of their book, whether they are still getting a basic gist of what is happening in the book or who their character is, or if they are really connecting and going deeper. A student who might find taking that same assignment and writing a journal about it may not give me the same depth of understanding because of the struggle they have putting pencil to paper. Right now, I have been talking place value and getting my students to showcase their number sense. We have started building a place value design in Minecraft and they have not had any problem transferring their knowledge of numbers into the Minecraft world. They are excited and the conversations they are having about their builds has given me a wealth of information about what they are understanding when it comes to numbers. The bigger deal for me, though, is how much more resilient my students are when it comes to using Minecraft. Students who would quit in the first few moments will beg me for just a few more minutes to add extra details to their build. They are much more willing to start over again if they have missed something or forgotten something in Minecraft. My students are much more willing to try and figure something out on their own when it comes to this tool. They get more creative in their thinking, they are more willing to problem solve. And the stories I could tell – of a student last year who never talked in class because she had social anxieties, but yet got up with her team and shared. Don’t get me wrong, she shared very quietly, but she still was willing to get up there because she was part of a team who was very proud of their build. I could tell you of another student who came in my first year at my new school who was reading very much below grade level and fought with me tooth and nail to write more than a sentence, but yet when I said would use Minecraft in class, he lit right up because he knew it was something he could do just like everyone else. He would be able to participate and not struggle, this was something he was able to do. It did carry over into his other classes and he was a bit more open to trying, he didn’t feel “dumb” (something he shared with me in a private conversation). I quite often end things off with the following question – why not use Minecraft in the classroom? If it is because you are afraid, as the teacher, of not being the expert in the room because you don’t know what Minecraft is about or how to use it, then please don’t let that be the reason. Your students will be more than willing to show you, they will be willing to be the experts that “teach” you and how powerful is that. 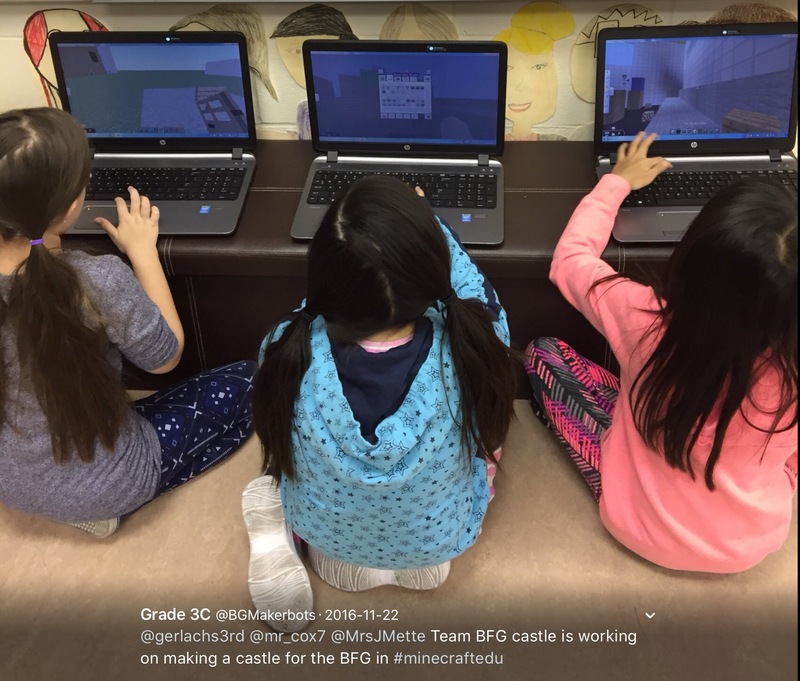 Our goal is to help students become creative thinkers, problem solvers, and collaborators, and trust me, Minecraft is a tool that will more than help build on those skills. On a side note, when I first came to my new school, three years ago, I was the only teacher using Minecraft in my classroom. Fast forward three years later and I now have colleagues in the other grades and classrooms now using it as well. They have seen some of the projects my students have done and have now started using it to showcase what students are understanding in math, social and much more. So to answer my original question – yes, Minecraft is a game, but it can also be much more in your classroom, if you let it. This entry was posted in Uncategorized on January 15, 2017 by catherined2014. For those that have read some of my posts before, you know I am quite passionate about my love of books and reading and trying to instill the same love for books in my students. I have written quite a few posts about the different ways I have tried to develop this in my students and why I believe it is so important to give students a choice and voice in the books they are reading. I could continue on, but I am hoping the point is coming across. I have tried to instil a love of reading by having book talks, having children share the books they are enjoying with each other, by skyping with other classes, by doing read alouds. Quite often, I like to think that my students pick up on how much I love books when I share my newest finds that I find in the library and bookstores with them and it gets them intrigued in books as well. And that’s from the horse’s mouth….. This entry was posted in Uncategorized on June 16, 2016 by catherined2014. I recently had a member of my PLN on twitter – my newest connection because of our love of Minecraft, ask me the following question. “We’re not crazy are we?” The reason he was asking this was because he had recently tried to share the possibilities of using Minecraft as a teaching tool to other teachers in his district. Unfortunately, it was a bit of a tough sell because people weren’t as open to it as he had hoped they would be. Funny enough, I had had the same experience just a few days before when I had done a similar presentation to a group of colleagues within my own district. While they saw the potential, they just were not as open to actually using it within their own classrooms. So I felt for him because it was a question I could relate to. He asked whether we were crazy, just ahead of our time or what. It was something that stuck with me and I spent quite a bit of time reflecting on what he had asked me and these are a few of my thoughts. Some will say “I don’t have enough time, I just have too much curriculum to cover and not enough for my students to play around.”. My response to that is you can gear a Minecraft project so it takes as much or as little time as you need. 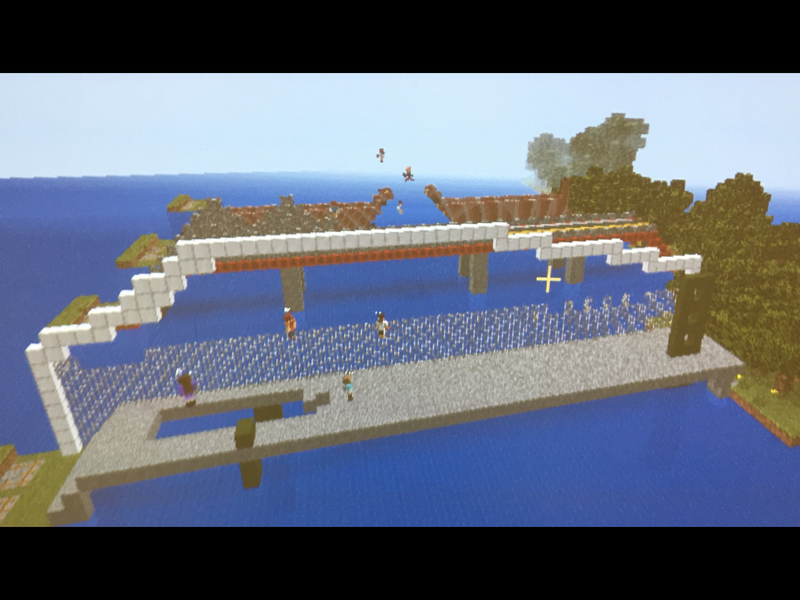 My students recently were asked to build a city in Minecraft to show their understanding of arrays – a multiplication strategy they were introduced to in math class. The project itself took 10-15 min of planning, two 30 minute classes of building and then today they started working through the cities to find out what their classmates had built and share the arrays they thought they saw. So in total, it took probably the same amount of time it would have taken for the students to do 4-5 worksheets on arrays and then a quiz showing their understanding. Some will say “How do I assess this? How do I show the students understand the concept I was teaching”. Well, using my same Minecraft lesson my students showed their understanding in their plan, in the city they built then by the conversations I listened to as I worked through the groups and heard them talking about the arrays they were seeing and writing in their math journals. They were engaged, they were talking math and they were seeing their math learning come to life in a way that was interesting to them and I could readily see those who were able to see and understand arrays and those who were still trying to figure them out. Some will say “I don’t know Minecraft so I can’t use it in my classroom.” And my response to that would be that you do not need to be the expert. Do you need a working knowledge – yes, it will be helpful and definitely help you see the potential. The more I work with Minecraft, the more I see how I can use it better with my students. But am I the expert, do I know everything about Minecraft – not at all. I am constantly learning, and my students are the ones who are teaching me. And this is something that they are so proud of – being given the opportunity to teach and mentor me in something they are confident in, switching the roles has given my quieter students, my struggling students a voice which is a positive thing in my mind. 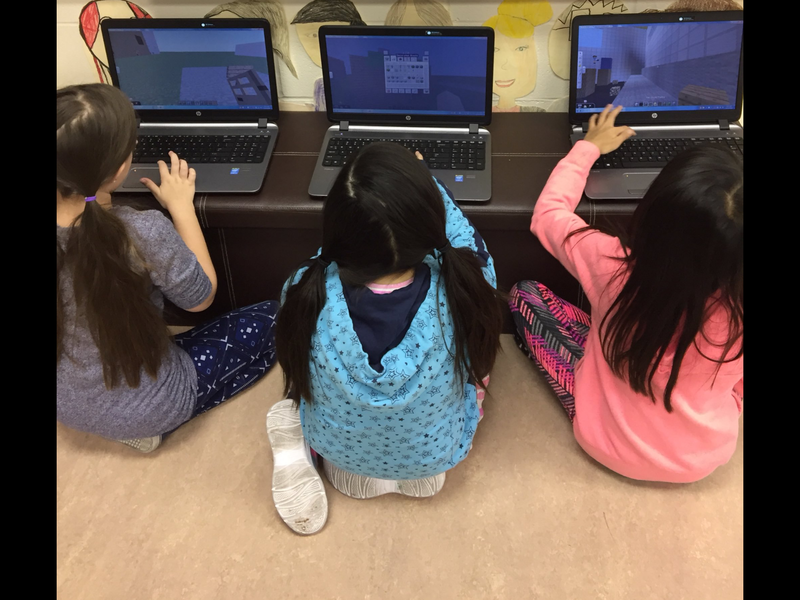 Some will say “Minecraft is just a game students play, there isn’t any real learning involved.”And to that I will say – my grade three students have had to learn the importance of collaboration. They have had to make compromises, learn to work together, giving each other jobs to get the task done in the time given. 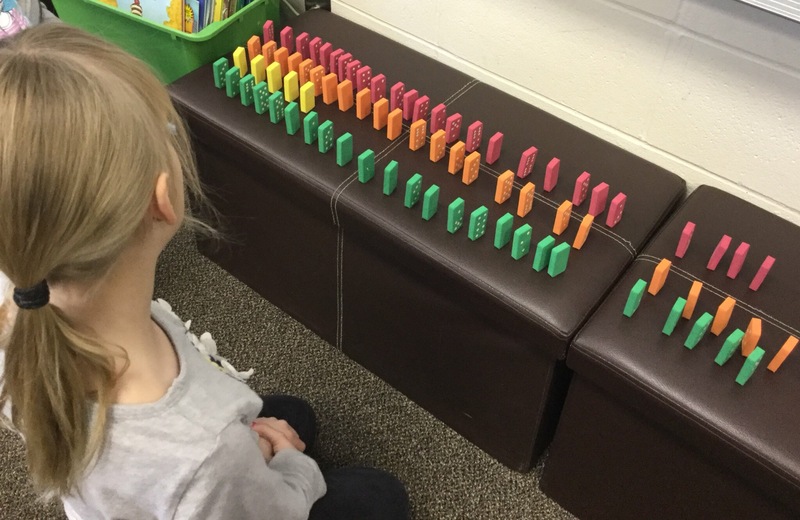 They have learned to communicate – talking about the things they have built, sharing their learning in a variety of forms, written and orally. My students have had to learn to problem solve because the plans they came up with on paper did not translate when they started building. They had to think creatively, work together to find solutions but as I have mentioned before it is amazing how willing they are to persevere when they are given the opportunity to use Minecraft. And honestly I think these skills will take them much farther in their learning journey. So back to my original question I don’t think we are crazy or ahead of our time. We have just been willing to risk and try something new, something that is engaging our students. And at the end of the day that is who is the most important opinion – are our students open to the possibilities of using Minecraft to showcase their understanding? The answer to this is yes, so that is the opinion I will focus on as I continue to learn to use Minecraft in my classroom. This entry was posted in Uncategorized on March 23, 2016 by catherined2014. I love giving my students an opportunity to make things. 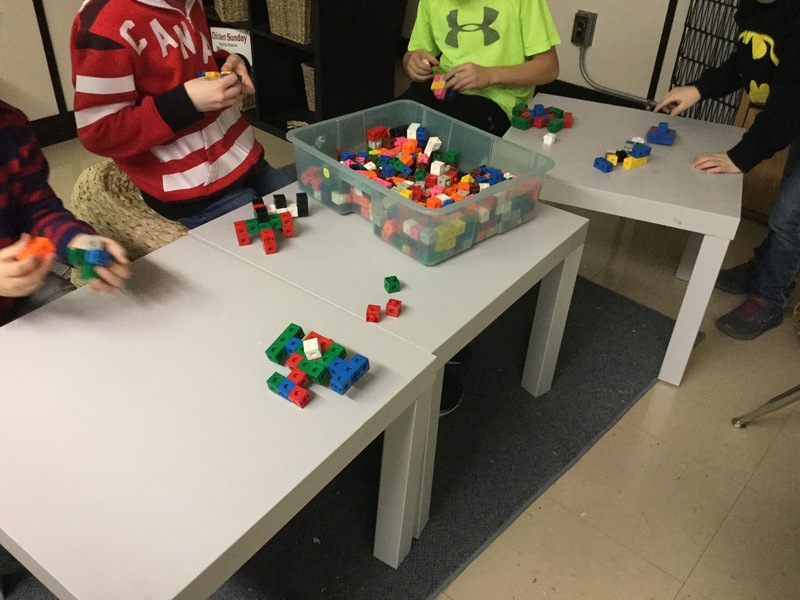 I have maker bins in my classroom – Lego, Knox, Playdough, marble runs and all sorts of other things that involve them working together to problem solve, collaborate and just figure things out. 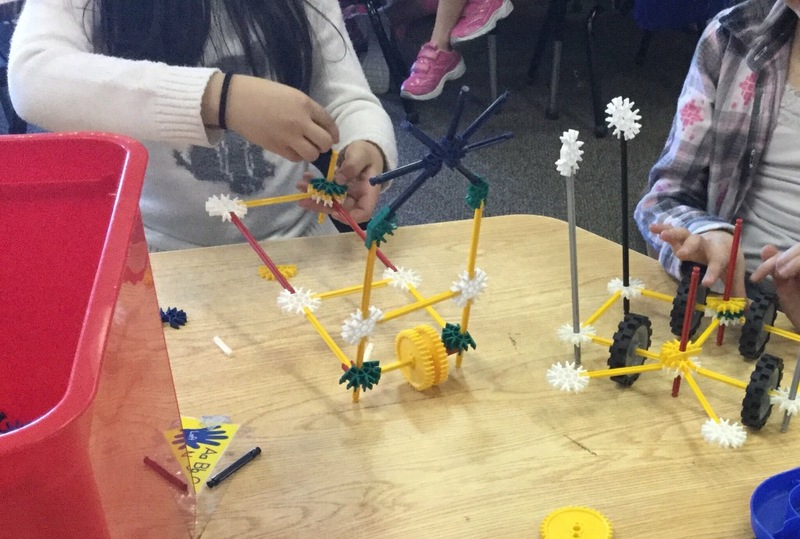 However, I am also lucky enough to have not only one unit, but two, in my grade 3 science curriculum – “Building with a Variety of Materials” and “Testing Materials and Designs” where they are challenged to build something in the classroom and then test their design to see how it worked. Last year my grade partners took a chance on a crazy idea I had and we had a giant cardboard arcade unit. 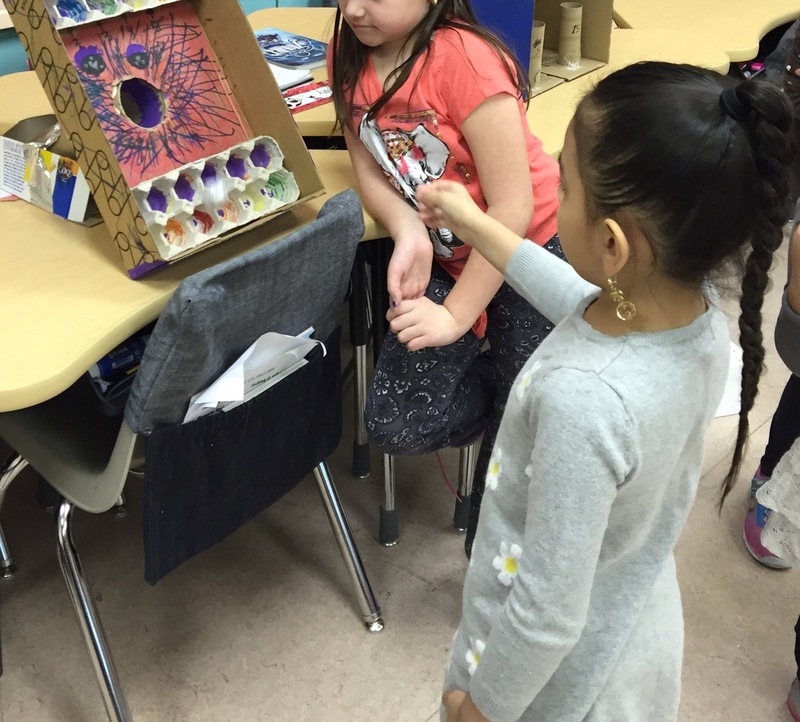 (you can read about the experience here – Our Cardboard Arcade Journey) It was honestly a great project based learning activity and both my students and I learned a lot from it. So when the time came around this year, there wasn’t much debate as to whether we would do this project again. It was more how could we improve it. The students were actually chomping at the bit to start – it was one of the first questions my students asked when they walked into the classroom, were they were going to be allowed to build their own arcade games this year too. (they had remembered going to the gym and playing them last year). So it was funny how quickly they all hit the ground running with this project. Many started looking at YouTube videos to get ideas, many talked about how they had seen games they liked last year and were going to make them better this year. And they were correct in those statements – the quality of the games my students came up with this year were more better than last year. We gave the students the same parameters in our expectations. Their games had to be firstly functional – potentially over 150 people would be playing their games by the time the afternoon was done so it needed to be in good enough shape to play. Next the game had to be sturdy – and we had long discussions as to what this word actually meant. This was something that quite a few of the students found challenging this year – many of them thought that if they added more duct tape, then the sturdiness factor would just come. The “less is more” conversation came up more than once during the unit. But in the reflections after the build, quite a few talked about how they would have done things differently when it came to making their games sturdy so this was a good learning experience. The last piece was the extra add on -making their game eye catching so that it stood out from the crowd of over 60 games that would be in the gym. It was again a great learning moment when some realized that they themselves could be the eye-catching piece – that if they played their games or called friends over to try, that could be the catalyst that got people to come play their game versus another one. I will warn you that while this unit is an amazing learning experience – it is not for the faint at heart. My room was a mess of cardboard, boxes, tubes, tape, glue and much more for over a month. I had to give up control of the room and just be willing to be okay with the organized chaotic mess (which was hard at times, I will not lie). But again the end result was I had students that were engaged and excited about their learning. The ones who found things easy in some areas (reading, writing) were challenged by bringing their design to life. Quite a few the design had to change because what they had on paper did not translate to real life. Some had to persevere because their designs did not pass the sturdiness test and there were quite a few back to the drawing boards for some. But I saw student after student digging in and being willing to try, even those who if this activity involved doing it on paper would have given up long before. On that final day when we had masses of students running around the gym trying out games the students had built, I saw happy and excited faces. I saw quiet students coming out of their shells to talk about how to play their games. I saw students who might not have been the best writers beaming because grade 6 boys were excited to play the game they had designed and built. For me, the best moment came when one of my more challenging boys in my class came to life because his dad had taken the time to stop by for half an hour to see his game. The memory of the smile that lit up his face will be one that I tuck away in my own memory box. And that is why projects like this are important. Why being willing to give up control and let my students just build, make a mess and figure things out is essential. When we do these things we give our students meaningful learning experiences that they will remember. And isn’t that at the heart of what we are hoping to do in the classroom?? This entry was posted in Uncategorized on March 20, 2016 by catherined2014.